This necklace has three main pieces which are designed to be worn together, but may be worn separately as well. 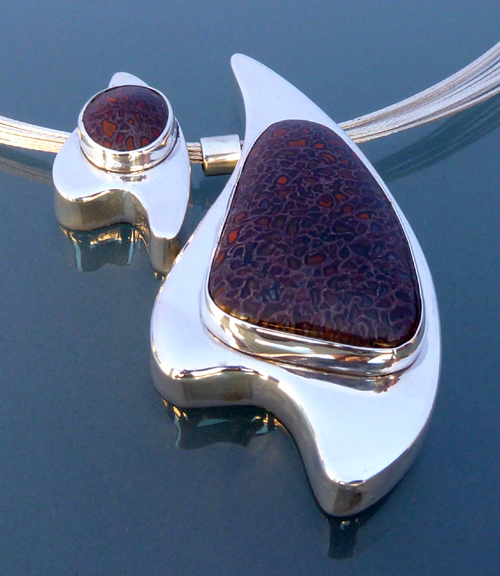 Dinosaur bone, with deep shades of brown, maroon, red and tiny flecks of green are set with highly polished silver. The two main pieces are hollow forms. The bone in this piece was found in Southern Arizona. The large piece is about 2 1/2 inches long by 1 1/2 inches wide, and the small piece is slightly bigger than 3/4 inches long by half an inch wide. The pieces altogether are about a half inch thick.